A harmonious room design influences the persons in it. A pleasant atmosphere in business premises not only has a positive impact on how employees work together, but also on relationships with customers, clients, guests or patients. In her guides, business feng shui expert Heike Schauz illustrates design ideas that are easy to implement and which contribute towards boosting wellbeing and improving the working climate and, ultimately, towards a company’s success. The „Business feng shui explained in images – practical ideas from a practitioner“ series of e-books is distinguished by a large number of colour illustrations and recommendations orientated to solutions. In the first edition, Heike Schauz elucidates protection, one of the most important topics. 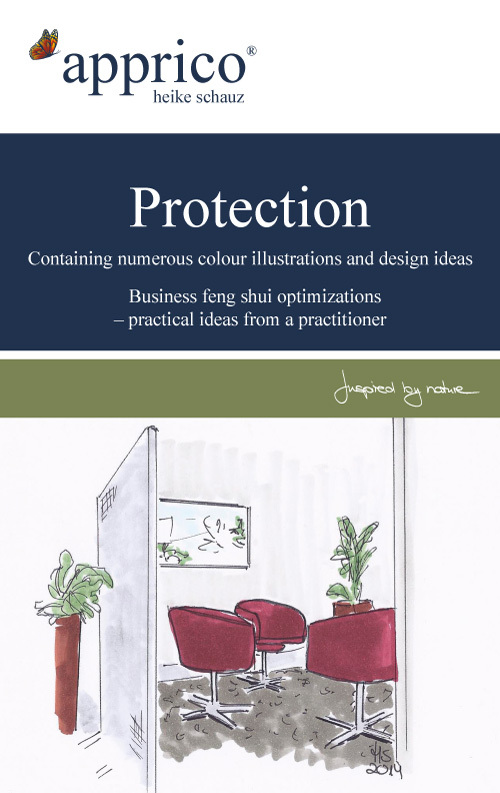 A top feng shui consultant, she gives specific tips on how to design protected areas in offices, company buildings, hotels, shops, cafes, restaurants and doctors’ surgeries. With reference to a number of before and after examples, she points out the initial situation and the approach towards optimising various room situations. The pocket feng shui books by Heike Schauz primarily serve to provide impulses. They are neither a substitute for well-founded training as a feng shui consultant nor for individual business feng shui advice.